Quickly wash any window to a streak free shine with this professional quality set. The telescoping pole provides a long reach, and the advanced design makes any glass surface easy to clean. With these tools, anyone can make windows and mirrors spotless no matter how high up, or hard to reach they are. Each set includes two microfiber window washing tools with built in squeegees, and is perfect for anyone that wants to clean their windows quickly and easily. The smaller washer is great for tight areas, smaller windows, your vehicle, in the bathroom and more. The larger tool features a lightweight, aluminum handle that can extend to a full 59", so it is great for larger windows, areas that are high up, the exterior of your car or house, an RV, or anywhere else that might be out of reach. 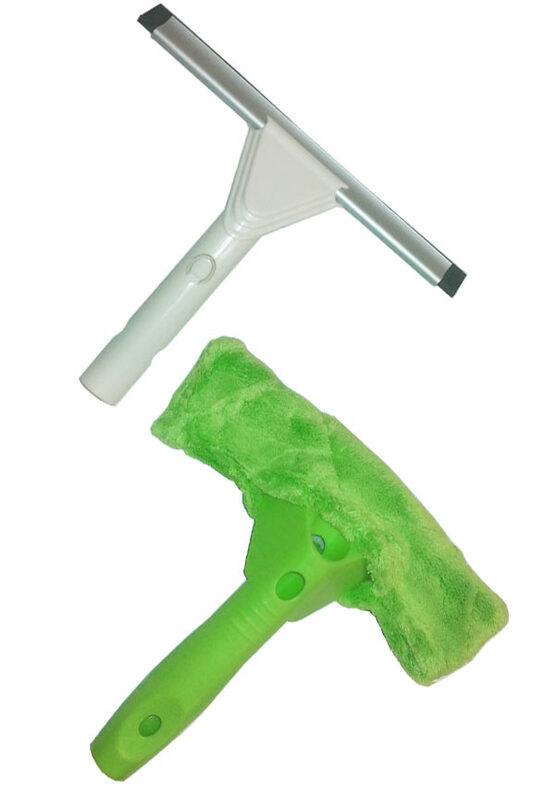 These great tools combine the awesome cleaning power of microfiber with the drying ability of a traditional squeegee. Clean and polish without extra sprays, and leave the surface free of any spots, streaks or lint with little effort. Use each tool as it comes, or separate the microfiber from the rubber blade to use each part by itself. Simplify window cleaning, and cut the time it takes in half. Each of the included tools is actually a three in one washer, so you will have incredible cleaning ability and versatility at your fingertips. The larger one has a wider pad and blade, and it attaches to the extension pole, but other than that, they work the same. Use the microfiber scrubber and squeegee blade connected together as one tool, or quickly click them apart to be used separately. When combined you can clean and dry with a single motion, or clean and then come back for drying with a slightly different technique. If you would prefer to do both parts separately, or use one tool at a time for specific jobs, simply take them apart. Add the telescoping pole to the larger tool, and use it as an extension squeegee, a long reach window washer, or both. Bring the smaller one into the bathroom to quickly clean windows and mirrors, or use the flexible blade alone to dry your shower door to a spot free finish. The versatility and durability offered by this set makes it perfect for home use or professional jobs, and with fool-proof results, it will save time, money and effort in the process. No more crumpled newspapers, rolls of paper towels or piles of cotton rags. Skip the harsh window washing chemicals, and forget about overpaying for a professional service. Use this affordable set to clean and dry any glass surface with ease. No window will be out of your reach, and you will never have to worry about results, or clean a surface twice when you use this set. Although the long pole provides ample reach for most situations, the durable material is also lightweight so it will not cause strain over long periods. Don't get overwhelmed by the ability of these tools, because despite versatility they also provide one of the easiest and most thorough ways to get your windows clean. Because the squeegee blade is commercial grade, and the pads are machine washable, it will provide years of use without wearing out. To use it, determine if the tool will remain whole, or be separated. A quick button press will slide the parts free, and in reverse, a click will lock them back in place. For second story windows, or other hard to reach surfaces, attach the large tool to the pole and secure with a click. To adjust for length, simply twist to loosen, extend to desired size, and then twist in the opposite direction to lock it in place. It will provide five feet of reach when fully extended. To prepare for cleaning, wet the pad, or spray the glass lightly with water. When wetting the microfiber, wring out until it is no longer dripping prior to use. You can use soaps and cleaning solutions if you want, but water alone will remove 99% of all dirt and germs. When washing, clean with the microfiber strip and then dry completely with a single stroke using the squeegee. This can be done with one motion and the right technique, or two separate passes. The powerful pad lifts and locks in any dirt, and the professional quality blade eliminates all left over moisture. You can even separate the two parts of these tools. 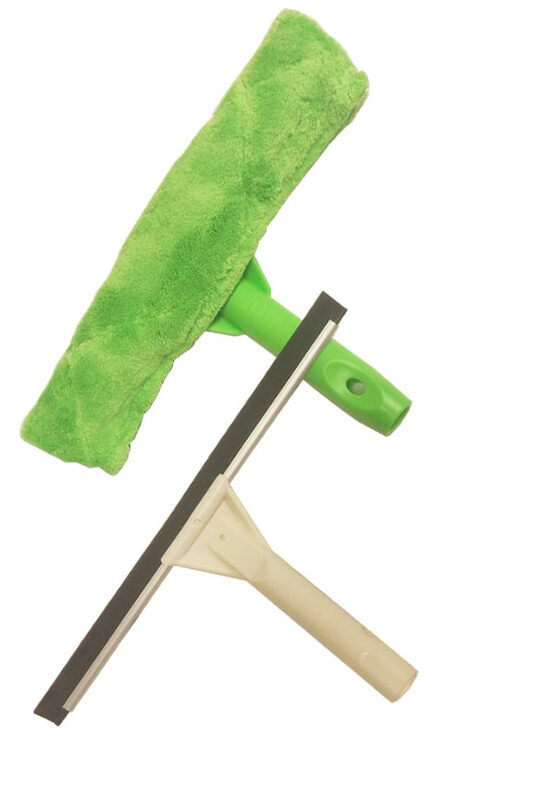 Quickly pull it apart to reveal a regular squeegee and a stand alone microfiber scrubber. You can use the scrubber by itself and then come back and squeegee dry or just use the squeegee alone. You will find many different applications where this feature will be useful. When finished, rinse and hang dry the pads, or toss in the laundry for cleaning. Wash and dry car windows inside and out. Even works in tight places for windshields. Clean exterior windows on your house without a ladder or ruining landscaping. Clean mirrors and shower doors in your bathroom. Wash a glass patio door quickly and efficiently. Use for skylights and other hard to reach glass. Wash RV windows or boat windshields. 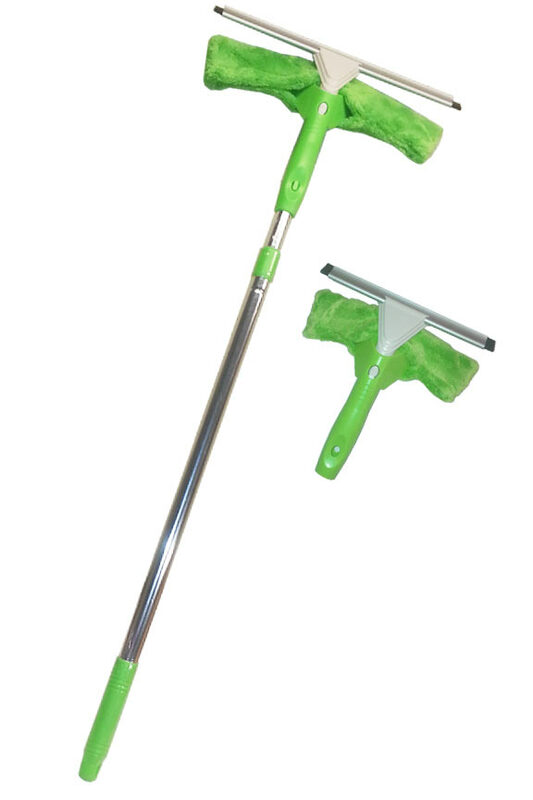 Use the squeegee and pole alone to dry floors and other surfaces. Use the pad alone to wash floors, walls or even vinyl siding. With these two tools no window will be off limits. You will be able to quickly clean to a streak-free shine in minutes, and with only water as a detergent. Each pad is machine washable hundreds of times, and you won't even need to clean them after each use. Simply mist surfaces with water or dampen the pad to clean windows to a sparkling shine, and the squeegee will remove any excess water. Cleaning patio doors and small pane windows couldn't be easier or less time consuming. Since microfiber has billions of fibers that attract and trap dirt and dust you don't need strong chemicals to make your windows sparkle. You can use a watered down window cleaner, an ammonia solution, some vinegar or your other favorite cleaner if you want to, but the great part about these washers is that you don't have to. You will achieve professional level results with just water. Guaranteed! Order Yours Today! Dimensions small - 9.5" x 9" - large - 9.5" x 13"
Uses Windows, doors, shower, RV, car and more. Great indoors or out. Microfiber Window Washing Set - Get a streak-free shine with just water and these great tools. Cleaning glass has never been this easy. The set includes two complete tools. One small and one large with a telescoping handle. I use the hand-held version of this product everyday to clean my shower/shower doors. It works great. I've also used the extension version to clean the outside of my casement windows and again, it worked wonderfully. I would definitely recommend this product to others. We love the window washing tool. I need to order another one to use at my home in Myrtle Beach. This is the first squeegee that I have purchased that actually works. I love it. I also love the fact that I don't need to use any cleaners with the microfiber pad. I just purchased another one for my daughter. I purchased this item to wash the windows on my beach house in Delaware. I does a fine job of washing and squeegee-ing. However, the wash cloth and the squeegee are on the same side of the handle. It would work much better if once you wash the window, just flip it over and squeegee it. They're both on the same side and they're a bit awkward to use that way. The wash cloth tends to get in the way of the squeegee and you have to use it at an awkward angle so as not to interfere with one another. P.S. Not he other end of the handle but the other side of the handle. Do you have this pole in 4ft reach? The extension pole in this set can be set to 4 ft.
what is the maximum reach for the pole ? Exact reach will depend on user height and arm length. With a squeegee attached to the pole, you get 65" of additional length added to your outstretched arm. No. The handle will not attach to another extension pole. Can this item be shipped to South Africa? Does the smaller squeegee also attach to the extension pole? I have small window panes on the second floor so the larger squeegee won't work. Can I buy just the microfiber/squeegee parts but not the pole? No. At this time, these tools are only available as a set. Replacement Pad for your Microfiber Mop. Wet or Dry. 18"